Green World Management consultant & training institute is offering for Nebosh Course in Ahmedabad Only!!! GWG is one of the world leading safety training provider which is conducting the UK approved Nebosh certification courses in across the globe.!! GWG provides safety related certification courses like Nebosh , IOSH, HACCP, HABC, OHSAS Lead auditor course, Safety Media course, ADOSHEM, Dip in Offshore safety, Dip in Fire engineering & safety management courses etc. The NEBOSH is aentry point for those people wish to be in the field of health and safety management and for the people to update the knowledge in the safety field. NEBOSH do not require any previous health and safety knowledge but a good knowledge in English is much required to meet the examinations. National Examination Board in Occupational Safety and Health (NEBOSH) is an independent charitable UK-based examination board founded in 1979, provides vocational qualifications in safety, health& environmentmngmt. & practices. It provides different levels of qualifications in health & safety,It does not provide training directly, instead it forms the syllabus and other formalities such as examinations and practical assessment. The Nebosh Courses are delivered by NEBOSH Accredited Course Providers. How to choose best institute? Choose a leading education provider and corporate trainer in the field of Occupational Health, Safety and Environment. Ensure that the tutors are highly qualified and experienced professionals to train and guide students and workers on various aspects of workplace safety and health needs. Contact the alumni of the course provider before you enroll with them. GWG has branches in India – Chennai, Mumbai, Kolkata, Delhi, Kochi, Hy derabad, Ahmedabad etc. FLASH OFFER Only For AHMEDABAD !! 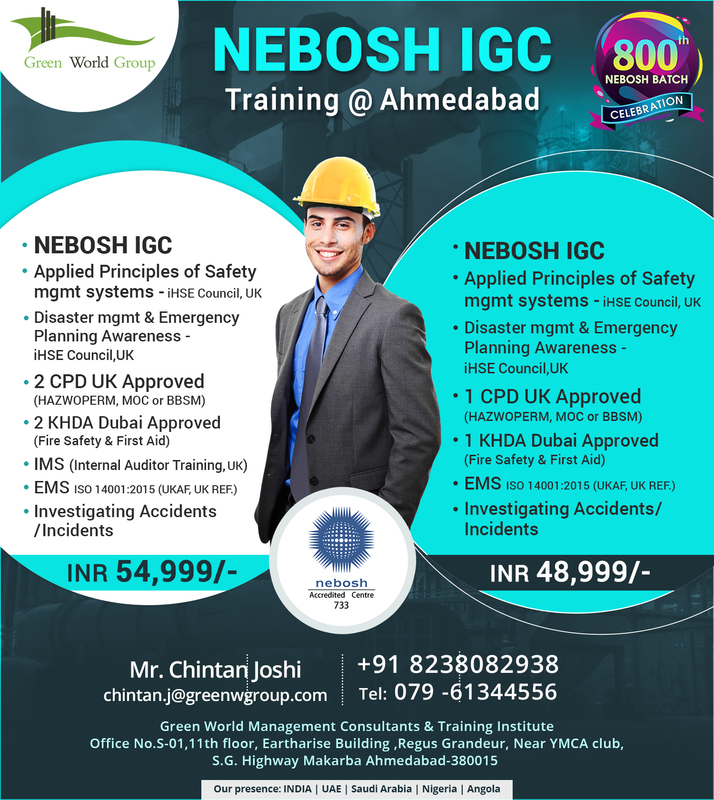 Join NEBOSH IGC – AHMEDABAD @ Get Free Training Until You Pass The Exam ! Enroll NEBOSH IGC with GWG & Attain Globally Approved DUAL Level-3 HSE Qualifications with additional Exiting FREE International Exiciting FREE Internaional HSE Certificates !! Thanks for your enquiry. Our Marketing executive will contact you soon. due to my unavailability to attend the class ? I will pay you the required amount or package requirement on your Bank account . Please give me your valuable advise . Thanks for your enquiry. Our Marketing coordinator will contact you shortly. want to resit for IGC 2 in 2016 ,previously done e learning IGC course and defaulter in 2013 (1st resit in IGC2).Again resit is possible?